There has never been a better time to start a small business. Thanks to social media platforms, there is a variety of ways in which you can market your brand, with just a little bit of creativity. More than half-a-billion people are logging on to Facebook daily. Twitter growing in unimaginable ways. Countless business networking opportunities exist on LinkedIn. While picture-based social media tools like Instagram and Pinterest have made it easy to reach out to millions of people to tell your brand’s story. All you need is a great idea and a dose of determination to build a business from scratch. The internet and social media have opened up a magnitude of possibilities for anyone with an internet connection, a computer and a camera. In other words, the digital age has leveled the playing field to an extent where anyone and everyone can compete in the marketplace. Nowadays, even tiny home-based businesses know that they need to maintain a social media presence. But, just ‘being on social’ is not enough. If you want to market your small business on social media effectively, then you should have the right kind of mindset. After all, it is not advertising, you have to do a lot more than just putting your message out there for everyone to see. Many people fail to realize that social media and its various tools have become one of the strongest ways to improve customer service. It allows you to hear from customers and prospects. But the reviews from your customers will not always be positive. You have to deal with them appropriately when they are unhappy, as most of these communications are visible to public. This is why you are under constant pressure to get it right. Let me put in a word of caution here. Just because social media has given easy access to everyone, doesn’t mean it is an easy journey. Trying to use this platform without expertise can actually stall your growth and cause the profits to drop! This is why you should be aware of top social media mistakes that can hurt your business and cause your efforts to go down the drain. But don’t fret. The public nature of social media have provided some great examples we can learn from. Just steer clear of these 11 classic social media mistakes, and you’ll watch your marketing graph rise in no time. You’ll notice a lot of new businesses committing this mistake without realizing it. We’re not asking you to be robotic and publish the same number of posts every day, at the exact same time. But following an underlying pattern can help your brand stay on top of your follower’s newsfeeds – and their minds. Maintaining a consistent framework can also help you stay prepared beforehand, hence making it easier to stay on track and alleviating the pressure to create new content on the spot. Sweetgreen is one great example of this. They have built an iconic brand based on the concept of fresh and sustainable food. All their content is clean and consistent. Whether you are using their mobile app, buying in store or following them on social media – their content is recognizable even without their logo. 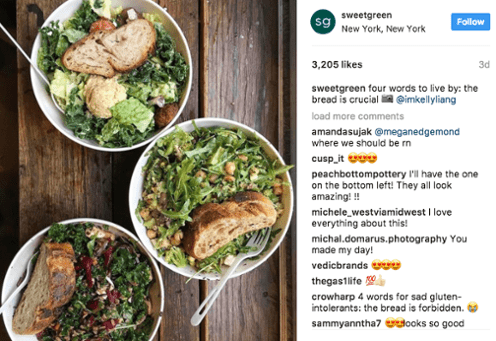 Sweetgreen has a strong visual presence and they also seem to have developed a clear emoji strategy for social media. Inconsistency can also reflect in your brand’s voice and design. If it looks like many different people are writing your content, it will be difficult for your fans to relate to you. And this is one of the main reasons to use social media in the first place. Similarly, if you keep on changing your color schemes and design, you’ll fail to impress your potential customers. This is why it is essential to build a style guide for your brand at the very beginning. It will make it easier for your team to collaborate while creating social media content. And your brand will end up making a positive and lasting impression too. Just because you have to maintain consistency, doesn’t mean that you have to post exactly the same update on all your social media accounts. It is important to understand that each social media platform is different. What works for one channel will not work on another. So, don’t link all your accounts together. You can post similar content, but tweak it according to the tastes of the users on that particular medium. Sharing your tweets on Facebook and posting your LinkedIn updates on Instagram can be really boring for people. It may look like you’re just being lazy and people will start to ignore your updates. So, be careful before it actually happens. Take a look at how Adidas is slaying it on social media! A note that all small businesses should keep in mind – you can’t head anywhere on social media unless you have a solid social media content strategy. It is crucial to identify your primary and secondary social media platforms, central theme of your content, target audience and hashtags to help you stay on track. You can reach your marketing goals much faster if you stick to your social media strategy. You’d be astonished to hear that the Dutch airline, KLM, makes €25m directly from social media. Their marketing experts revealed at the Festival of Marketing in 2014 how its last-click attribution model managed to generate such sales by using a remarkable social media strategy. Defining your target audience is the first step that will help you build an effective social media strategy. Start observing which social media platforms they prefer, and make them your primary marketing channel. Learn about your audience’s demographic, interests and online behavior patterns. Utilize this data to shape your brand voice, design and content themes so that they can resonate instantly with your audience. Your social media strategy won’t be effective unless it’s helping you reach some goals. This is why you should lay out the most common social media goals, such as awareness, user engagement, and direct response. Identify which key performance indicator (KPI) associates well with them. Alternatively, if you want to drive more clicks, you can post “Check out these deals on our instant coffee ranges and save up to 20%!”. 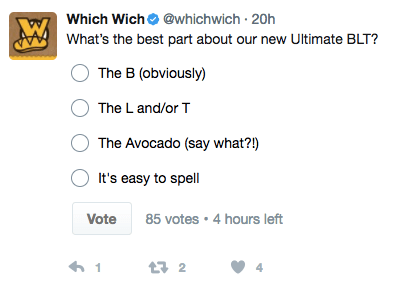 Which Wich Superior Sandwiches topped the charts for social media engagement in Q1, by using Twitter polls to engage social media followers and show off their vibrant brand personality. Always remember, don’t produce meaningless content without having a certain goal in mind. Your strategy is always fueled by data. Thus, take out the time to measure the numbers and evaluate your content’s performance on social media. User insights should be analyzed regularly and you can use free data analyzing tools that are available for all social media platforms. By measuring your metrics, you can get a better understanding of your hard work and choose to create better data-driven strategies to increase your social presence. For example, did a certain type of content perform better than another? Which channel helped you engage your audience most effectively? By taking the time to reflect on these questions, you can make a huge difference in the social presence of your brand by creating successful opportunities for content optimization. To further highlight this point, let us take a look at Dell’s case study. They faced ROI losses and a disconnect between marketing efforts and sales channels. All because Dell’s previous marketing strategy did not account for following up on leads through partner campaigns. Dell initiated a lead nurturing solution in which thousands of pieces of unique content was personalized for every lead. These leads were guided through interactive emails, personalized landing pages and more. This strategy enabled the viewers to explore and educate themselves about Dell’s products before deciding to buy them. The results Dell saw were nothing short of spectacular. They witnessed 35% increase in sale value in nurtured leads vs. unnurtured. Their engagement rate improved by 300% and it resulted in a $40 million incremental revenue from marketing partners. This is why you should make it a point to always follow up on leads and never leave your customers with a dead end when they are viewing your content. Dell’s efforts in creating a highly personalized campaign was rewarded instantly because it appealed to a wide audience. Social media is named so for a reason. It’s all about engaging and creating an approachable image for your customers. Forget the old style of push marketing. It’s all about creating opportunities to engage and converse with your followers. Make sure you regularly appreciate followers who took the time out to engage with your brand. 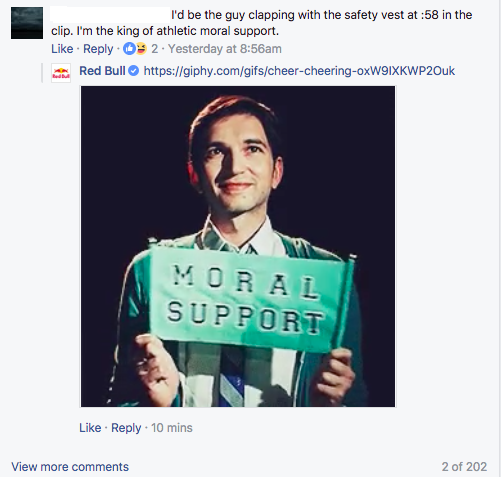 Red Bull does a great job of engaging with their fans on their Facebook page. Their responses are witty and entertaining, which also reflects their brand personality. It’s the perfect combination to stay on top of your social media game. Remember, your gateway to fandom is excellent customer support and community management. It may seem tempting to hide or delete negative comments, but don’t! Look at it as an opportunity to set things right on social media. In fact, always respond to negative comments with a heartfelt apology and it can do wonders to repair your strained relationship with a potentially loyal customer. Hashtagging is one of the most underutilized methods that can help you reach your potential followers instantly. It is often misused by the average social media user. Every hashtag acts as its own unique categorization tool. Try searching your business name’s hashtag on Instagram and Twitter and you might come across quite a few fans posting pictures of your product. One of the best way to boost user engagement on your Instagram profile is by sharing consumer-related content. Use this as an opportunity to reach out to them and thank them. If they have a complaint, try to resolve it as soon as possible. Reposting customer content is a great way to show the credibility of your business, plus it’s easy and you won’t have to think about new content every day. Bobbles & Lace Boutique is a great example of this strategy. They took their customer content to the next level by coming up with a hashtag “Tag Tuesday”. 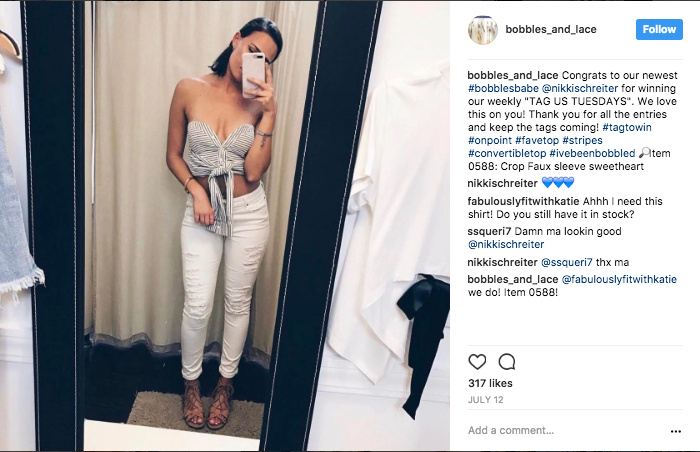 Customers tag them in their posts once a week for a chance to get reposted on their Instagram feed. It’s an excellent way to engage your customers consistently and increase your conversion rate. You’ll notice that your followers will soon turn into paying customers and your current customers will become loyal ones. If you are simply using social media to broadcast your business products and services, you are losing out on its true essence. Don’t turn off your followers by being robotic. Start a conversation with them. Treat them as individuals rather than customers, and make them feel that their opinion matters. This is the only way you can encourage true engagement with your brand. Read how Walgreens made a customer feel special via social waves. Share your daily ‘life’ with your audience. Give them a chance to know you and your brand inside out. People love to connect with people rather than mere logos. Remember that friend who won’t stop talking about himself? Well, no one wants to hang out with such people. Keep this point in mind whenever you compose a copy for your social posts. Customers can sense desperation from a mile away. Instead of using phrases like “we this” and “we that,” sprinkle some “you guys” and “our fans” to show that you actually care about your audience. This doesn’t mean that you shouldn’t promote any direct mentions of your brand. Just do it tactfully to suit the platform you are posting on. Humanize your business to a certain extent so that users can relate with your brand effectively. This can be done by re-sharing users’ posts and pictures, in which they promoted your product. Or you can post pictures of your hard-working employees, to show that your team is dedicated to giving the best experience to customers. 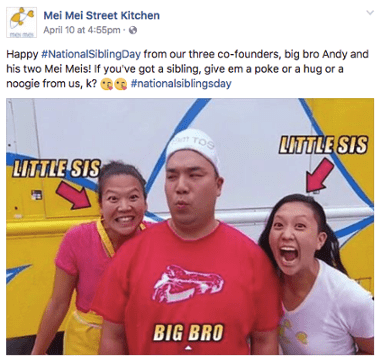 Mei Mei Street Kitchen has achieved this by profiling the people behind their business. They share funny anecdotes about the staff, making their customers feel more connected to the business. 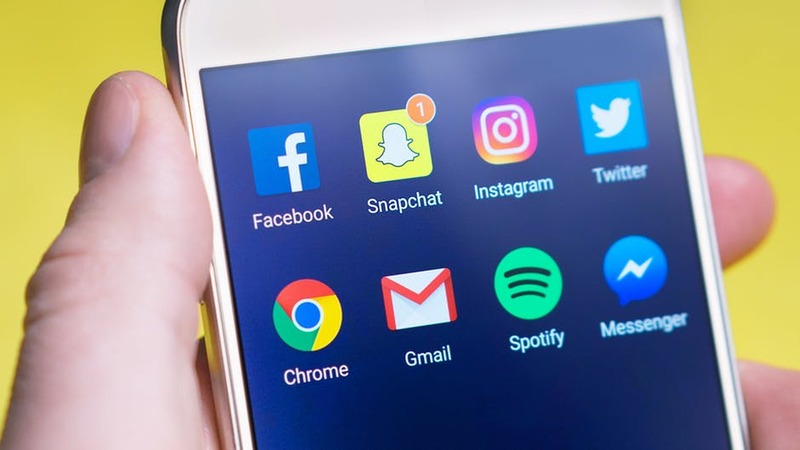 In a report published by WASP Barcode Technologies’, it was highlighted that only 37% of small businesses use designated business social media accounts to reach out to their audience. This means that nearly 63% of small business owners are blending personal and business accounts. Unfortunately, it will not only make your business look unprofessional but will also inhibit your personal activity on social media platforms. This is why it is important to create separate accounts for your business postings. The final mistake that most small businesses make while handling social media is thinking that they can succeed on their own without any training or support. It may seem easy to handle your personal Facebook and LinkedIn profile, but all we’re doing there is catching up with long lost friends or relatives. Creating and maintaining a professional social media account is a separate story altogether. It is not as simple as logging in and posting random stuff. Which is why it is better to hire a freelance social media manager. Or better yet, a content marketing agency that can do a great job at it. Armed with the resources, knowledge and experience, outside help can ease your load by doing the heavy lifting for you. Here are some case studies in which an agency helped 3 small businesses to grow their online presence. What’s more, it will also leave you with some free time to focus on other important areas such as product development and pricing. You won’t have to worry about your social media marketing strategy, because you’ll have a pro working on your behalf. The secret to increasing your social media presence is to think like your customers. Share what they want to see and provide them with impeccable customer service, and you’ll get a business-building channel in no time. It is natural to make a few common mistakes when venturing into a new marketing channel like social media. But don’t worry, a few mistakes can’t ruin all your hard work. Just do you research and ask for help whenever you need, and you can make social media an invaluable asset to market your brand.